Today marks the 42nd anniversary of the release of David Bowie's mid-70s masterpiece, Low, the first album of his so-called Berlin Trilogy (later joined by "Heroes" and Lodger). Working with the increasingly experimental Brian Eno, this album was a dramatic departure for Bowie and much has been made over the music, the strange (and strangely inspiring) milieu of the West Berlin recording studio up against the Berlin wall, Bowie's continuing battles with the coke monster, the highly experimental nature of the sessions, and the studio use of Eno's Oblique Strategies cards. To celebrate this happy day, and some of the strangeness around this record, here is a hilarious animated piece done in 2014 by The Brothers McLeod. The McLeod piece is actually an animation for a radio bit done by UK comedian Adam Buxton. It is a loving lampoon of Bowie, Eno, and long-time Bowie collaborator and co-producer, Tony Visconti, in the studio recording "Warszawa," one of the more haunting and inscrutable tracks on the album. You can hear Buxton's original here (though most of it ended up in the McLeod Bros animation). 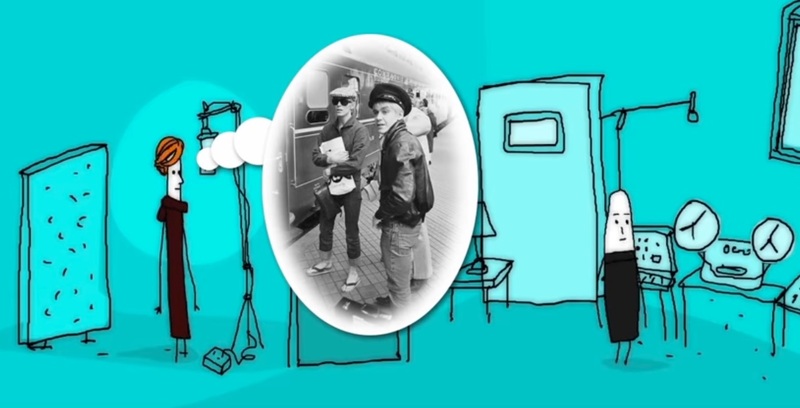 This video mini-doc, done several years ago by the Polish culture portal, Cultural.pl, retraces the train trip that Bowie took through Poland, with a stop-over in Warsaw, that inspired the song. On their website, you can read more about the trip, the song, and the Polish folk tune (Helokanie) that inspired some of the vocalization on the track. Below is Bowie performing Warszawa in Tokyo, Japan on Dec 12, 1978. In the The Brothers McLeod/Adam Buxton piece, the David character tells Brian how much he loves doing the Derek and Clive voices. This refers to a bit that beloved British comedians Dudley Moore and Peter Cook used to do. Bowie and Eno really did love that routine and would allegedly do it whenever they were together (a great reminder of what a nerdy goofball David Bowie really was). They would also take on characters in their emails to each other, Bowie signing his letters with names like Mr. Showbiz, The Duke of Ear, Milton Keynes, and Rhoda Borrocks. In the early hours of January 2016, Brian got a letter from David. Eno recounts it was as "funny as always, and as surreal, looping through word games and allusions and all the usual stuff we did." It ended with: "Thank you for our good times, Brian. They will never rot." The message was signed "Dawn." Seven days later, Bowie was gone. And, for a little bit more Low goodness, check out this instrumental outtake from the album, called "All Saints." Tres Throbbing Gristle, Batman!